Facts about Dominique chickens. Although the exact origin of Dominique Chickens is unknown, the Dominique chicken have been around for several hundred years in America. The Dominique chicken are also recognized as America’s first chicken breed. The name “Dominique” suggests that they might have been imported from a French colony called “Saint-Dominque”. The place is known as Haiti these days. Some may find it difficult to distinguish between Dominique and barred chickens. The former has rose combs while the later has single combs. The Dominique was bred in a huge scale during 1820s because the breed was a dual purpose fowl. The New York Poultry Society made the rose combed Dominique as the only standard for the breed and the single combed one was relegated. The Dominique was never bred for commercial purpose. Dominique chicken eventually eclipsed from the farm and shifted to the larger scale production gradually. The Dominique Chickens were popular till the long time enthusiastic Dominique breeders lived, around 1920. The new generation of breeders wanted to experiment with new varieties. 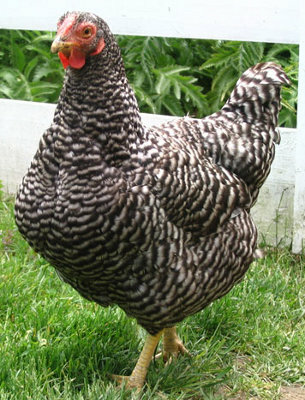 The Dominique is a medium sized chicken with a “cuckoo” patterned feather. The barred coloration is often referred as hawk-colored and helps the Dominique to appear less conspicuous to its predators. As told earlier, it has a rose comb with short spike that curves upward. This spike is the main characteristic feature of Dominique Chickens. The male Dominique chicken grow up to seven pounds (3.2 kg) while the females five pounds (2.2 kg). As the breed’s plumage is tightly arranged, it is more resistant to frostbite in comparison to any other fowl breed. The Dominique chicken can adapt to both hot and humid climates as well. Historically, the close feathering of the Dominique contributed to the pillows and feather-beds. Dominique chickens have a well arched neck and their heads always stay high up. The males have a “U” shaped outline in the back. The Dominique chicken have a broad body covered with long feathers. They also have long tail feathers, which is hardly seen in any chicken breed and is considered to the benchmark of highest of the American breeds. The back outline of females is like a slope, from the head to tail. Although Dominique Chickens are categorized as dual purpose breeds, they are treated as foremost egg producers. On an average, the female Dominique chicken lays 230-275 medium sized brown eggs per year.